Nothing is worse than a pet with bad breath but this could be an indicator of more serious problems. 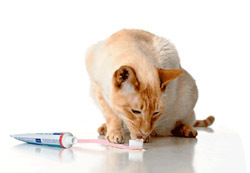 Rest assured, we have a solution to all of your pet’s dental needs. If left untreated, dental disease can affect the health of your pet’s entire body, not just their mouth. We are pleased to offer professional services with dental cleaning, polishing, and other treatments as required. We will also assist you in developing a dental health routine that you can use at home to prevent dental disease in your pets.